Did you enjoy the music from last week’s Community Spotlight? Well I hope so because this week we have some more! Eric Lawrence has created his own epic version of “The Guardian Theme” from Darkisders II. His love for the Darksiders II soundtrack inspired him to create this rocking cover and he deems it one of the best video game soundtracks he has ever heard. Aside from “The Guardian Theme” he also loves “The Crowfather” and “The Corruption” tracks. Not surprisingly Eric is very excited to hear the soundtrack for Darksiders III and play the game of course. Eric said, “I really enjoy the games and love the combat, boss battles, and puzzle solving!” We hope you love the new soundtrack and game and cannot wait to see how it inspires you! You can find more of Eric’s music on his website! Darksiders has inspired so many amazing creations, but for Brian Baruth, Darksiders also inspired his career! “The original Darksiders just really clicked with me, from first glance I love the stylized look it had, and all the character designs were so different from all the other games at the time!” Brian continues “Around that time I was also trying to figure out where I wanted my life to go, and always loving the art I realized, this, this is what I want to do!” From there Brian took his passion for Darksiders and began his career! This epic 3D piece was one of his senior projects in college. We are so glad that Darksiders inspired you to follow your dreams and we hope Darksiders III continues to inspire you! 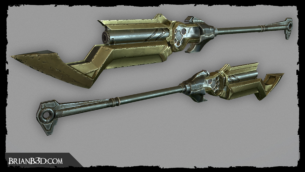 Make sure to check out more of Brian’s 3D work on his website! 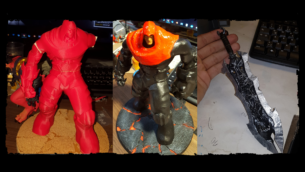 From 3D art to 3D printing, you Legion members sure know how to spread the Darksiders love! Kuroodium’s love for Darksiders and its apocalyptic setting knows no limits! He decided to create his own small statue when he could not get his hand on the original War and Ruin statue. The statue is still a work in progress but his passion with this project really shows through! We cannot wait to see it through! You can follow Kuroodium on Twitter to see more!